Jacq Emkes on The May Retreaters have sadly Retreated…. Susie Wetton on The May Retreaters have sadly Retreated…. Mary Haggerwood on The May Retreaters have sadly Retreated…. “A retreat that’s a real treat”. As organiser of the ‘bendy ladies’ trip to Pignoulet I was both excited and a little bit nervous about what we would experience – but everything we encountered exceeded all expectations. The food, the wine, the fresh air and of course the pilates were fantastic. Susie and James were fabulous hosts and are passionate about what they offer… I don’t think you can get any better! Bendy ladies are booked in next year! Le Pignoulet is a very special place to stay. Hosts James and Susie are so welcoming and their house is beautiful, warm and so comfortable. The food is sublime and the Pilates barn facilities are fantastic. We spent a lovely five days thoroughly enjoying all this special place has to offer, so much so, we have already booked for next year! It’s the perfect place to relax and unwind and I can’t recommend it enough. I thoroughly enjoyed a relaxing couple of days at wonderful Pignoulet. James and Susie were wonderful hosts who provided us with delicious meals and wine. My room was beautifully decorated and had a fabulous en-suite bathroom. My overriding memory of our stay would be the joy of staying in such a peaceful and beautiful area. The sunny weather enabled us not only to enjoy eating lunch outside (despite it being mid-winter!) but also to do a spot of star gazing once the evening came. 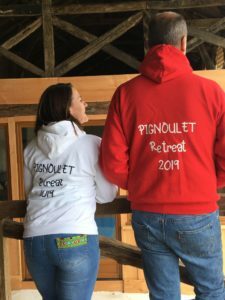 I would recommend a visit to Pignoulet so that you can thoroughly relax in the knowledge that you’ll be wonderfully cared for in a fantastic environment. Wow! It is almost impossible to find the words to describe how wonderful the Pignoulet experience is. From the moment I arrived, I felt completely cocooned in the peace and beauty of Pignoulet. Susie and James, you are the perfect hosts. 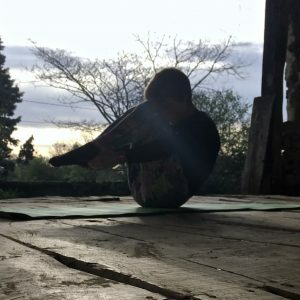 Everything has been considered form the english plugs in the gorgeous bedrooms to the stunning, fully equipped Mat Pilates studios and the extensive support you give to us teachers. The food has been fantastic, so flavoursome, wholesome and completely delicious and of course the wine has flowed freely! Thank you so much for sharing your slice of heaven and i can’t wait to return. I am just home from the most perfect weekend at Le Pignoulet. The house itself is stunning; beautifully and sympathetically renovated, spacious and comfortable with many places to gather together with friends and family, or seek out a quiet corner to curl up and read a book. Our hosts Susie and James are one of the most warm and generous couples I have ever had the pleasure to meet. We were instantly made to feel at home and welcome, and nothing was too much trouble. The array of delicious meals they cooked for us was superb, with fresh local produce making every meal burst with flavour. I can’t wait to return next June with a group of my Pilates clients so that I can share this little slice of heaven with them. I’m sure that like me, they will fall in love with Le Pignoulet! Wonderful hosts; warm, passionate and fun. James and Susie made us feel so welcome, they treated us like friends staying over for the weekend. The building has been lovingly and expertly updated, which means that the facilities are as you would have in your own home. What shines through is the love and passion that James and Susie have for their project here at Pignoulet. They are clearly a couple who take pleasure in doing things and doing them well. What a weekend! Susie and James welcomed me with a group of friends last week and I have to say it was the most relaxing weekend I have had in a very long time. It felt like arriving home after a busy, stressful day at work and just leaving our worries behind. The house is set in a lovely, quiet area and the facilities there are outstanding: beautiful pool, spacious, clean bedrooms, quirky Pilates studio, lots of space to sit and relax. The food was better than anything I’d expected, and catered for all the dietary requirements in our party, seamlessly. I am about to put down a deposit for next year and I cannot wait to be back! Thanks James and Susie for being the perfect hosts. This was my second visit for a weekend of Pilates. I hadn’t thought it possible to better my first visit but how wrong can you be!! It was a weekend of fun, friendship, wonderful food (and wine!) – and lots of Pilates! We started the weekend knowing only one or two others in the group but ended as a group of long term friends – Susie and James and Pignoulet have that effect on you. I am so looking forward to returning for retreats 3 and 4 next year!!! I wasn’t entirely sure what to expect from my weekend and was pleasantly blown away at every element. The rooms are spacious and clean, and the beds were super comfy beds. We didn’t spend very much time in our rooms, but had a lovely view when we did. The night sky is just stunning! The food was incredible, and with multiple allergies to cater for, Susie and James really were up against it. Far from underwhelming “free from” processed nonsense, they put some serious effort into ensuring our party of 10 ate together in an inclusive way, which is really important to people who feel excluded everywhere they eat. The local wines are delectable, and don’t give you a hangover the next day! We had brilliant weather for September, and were able to spend a few hours by the pool each day, which was amazing considering it had started getting chilly back home in the UK. The pilates classes were the bonus for me, and although I’ve not done pilates for many years, I really enjoyed them. Susie’s teaching skills are phenomenal, and it’s made me want to continue practising locally. Coming home with sore abs felt like a rite of passage. I’m not sure that words can describe this place and the wonderful people who run it. From the moment we arrived we were made to feel welcome…from welcome drinks, to a tour of the house and a wonderful lunch. Nothing was too much trouble; indeed I’ve never met such kind, gentle, accommodating, friendly hosts. And I’ve travelled a lot. Our group wasn’t the easiest to cater for. There were multiple food allergies, coeliacs and vegans and we were all fed with gorgeous food and never once made to feel different or awkward. As a mum to a child with coeliac disease I never get a break from planning or making food. The weekend was proper relaxation. Never once did I think about food and I was able to truly relax for the first time in over a decade. The Pilates classes were fantastic…adapted seamlessly for both total beginners and advanced alike. If you want complete relaxation whether that be with a group of friends and family with no ‘extras’ or as part of a retreat where your every need is catered for, then this is the place. What an incredible retreat. Visiting for a long pilates weekend with a group of friends, Suzie and James welcomed us into their home from the moment we drove through the gates. I can honestly say that I haven’t felt as calm and relaxed in years. 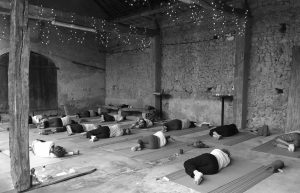 Suzie’s pilates sessions were perfectly paced for the wide range of abilities in our group and easy to follow, with plenty of attentive guidance when we needed it. 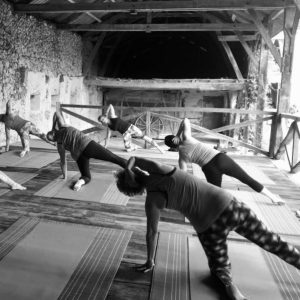 Best of all, the pilates studio was set in an open barn area, surrounded by the sounds of nature and fresh air. Truly special. The house itself is a delight, with loads of character, comfortable bedrooms, large pool and pretty gardens. 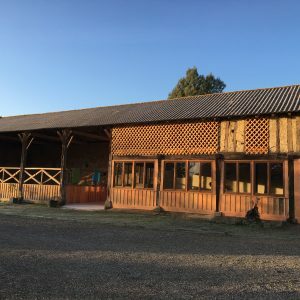 Set in beautiful countryside, close to the Pyrenees, Domaine du Pignoulet is the perfect base to explore the surrounding area. Staying full board, we were treated to incredible fresh, home-prepared food, with a whole range of allergies and intolerances in our group being catered for without fuss. Being Coeliac, it was a treat to be looked after with wonderful meals without worry. The flourless Orange Cake and Cacao energy bites were divine! A couple of days on and I am still reaping the benefits of the relaxation experienced. I feel privileged to have stayed in such a lovely place with such amazing people. Thank you so much Suzie and James for making our break with you so special. I truly hope that I will be back soon. Had the most amazing long weekend thoroughly spoilt by Susie and James. 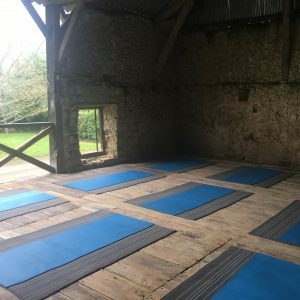 Pilates sessions couldn’t have had a better setting in the barn watching the sun rise in the morning. Every session was different and I still cant believe we did a whole 8 hours over the 3 days. The food was just beautiful…and so was the wine! I have never entered a holiday let and received such a warm welcome in my life. From the very moment we drove through the gates Susie and James welcomed us with open arms to their beautiful home. The property is stunning, the bedrooms comfortable and the bathrooms spacious and spotless. Thoughtful touches, like mosquito plug ins and UK adaptors had been left in the bedroom for us. The garden is very pretty and the swimming pool most welcome on a hot day. The local area is very pretty, with tiny French villages, local markets, old churches and sunflower fields galore. 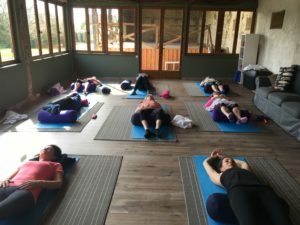 We were there for a pilates retreat and Susie is a fantastic teacher, coping with a mixed-ability group seemingly without effort. 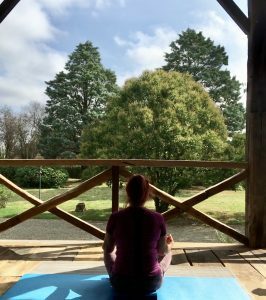 Waking up to a morning pilates session with the sounds of the farm animals waking up, and the sun peeking over the horizon is priceless. 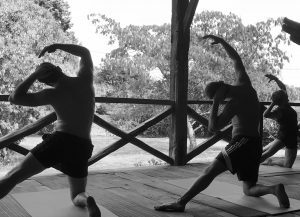 Real men do Pilates at Pignoulet retreats! We loved this house! We stayed here with friends and family and lived it. The setting is stunning and sitting outside to eat on a warm evening with family and friends has got to be one of the nicest things ever. Lots of local activities including tennis and wake boarding which we all loved. A great local food market and a man with a van of delicious cheeses turned up mid-week. the pool is lovely, the house is well equipped – all in all we loved it! Great property in a great area of France. Home from Home. Really well restored property that you wish was yours! The food was excellent and the local restaurant we visited was French cooking at its best. Great place. Fantastic holiday. My husband and I had a fabulous long weekend staying in this super property. Even with the winter weather being horrible we lit the fires and enjoyed eating local produce and drinking fine wine while soaking up the atmosphere. We would love to go back with our large family in the summer. We loved our visit – the house is huge and stylish with high ceilings and large shuttered windows opening onto country views. There’s loads of entertaining space and garden for the children to run around in, along with a wonderful swimming pool. It’s a perfect house for a large house party. You can go walking and cycling nearby and visit local historic towns for shopping, restaurants and wine buying. We highly recommend! I wanted to say a massive thank you for hosting five of the most fantastically relaxing, celebratory and French days I have ever experienced. The house is gorgeous and the food was relentlessly delicious. Thank you so much for such an epic five days. The food we ate was consistently restaurant worthy, truly delicious and so varied. I can only imagine the amount of thought, preparation and effort you put in. I really will never forget those 5 days. Super semaine en famille dans cette maison spacieuse et confortable. la maison paisible et pleine de charme est vraiment idéale pour accueillir une grande famille où parents et enfants préservant leur intimité. Nous avons apprécié l’espace des chambres, le confort des salles de bains, la grande cuisine et la lingerie, le grand pré où nous déjeunons tous les jours. Les salons confortables nous ont permis de faire des parties de loup garou endiabées… et la piscine, un régal!!! I will never forget the experience and the work that 2 people put in behind the scenes to make sure everyone has the fantastic memories they do. Everything was so special – the people, the food, the house and the exquisite surrounding French countryside in which it was all set. Your house is so beautiful and charming; I can understand why it is so loved by your family and so full of amazing memories. A little piece of heaven! Thanks so much for the restorative nature of this wonderful retreat. 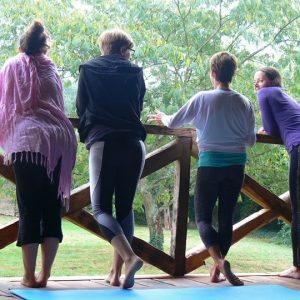 A fabulous concept and combination – yoga, Pilates, great food, wonderful location and super company. Thank you Susie and Kim for your talent, patience, attitude to life and kindness. I have been physically challenged, spiritually uplifted and my “batteries” recharged. The care and thoughtfulness of our hosts and teachers brought peace and nourishment and encouragement. The setting was just perfect! Thank you for an amazing experience that has inspired so much in me!